↑ Déclaration par la Républic du Burundi de la reconnaissance de l'État du Kossovo (French). Ministère des relations extérieures et de la coopération internationale de la Républic du Burundi. 2012-10-16. ↑ Denmark recognizes Kosovo as an independent state. Danish Ministry of Foreign Affairs. 2008-02-22. Архів оригіналу за June 27, 2009. Процитовано 2009-04-22. ↑ Gambia recognizes the independence of Kosovo. Ministry of Foreign Affairs of the Republic of Kosovo. 2009-04-07. Архів оригіналу за May 13, 2009. Процитовано 2009-04-08. ↑ Grenada njeh Kosovën (in Albanian). 25 September 2013. Процитовано 2013-09-25. ↑ Konfirmohet njohja nga Guinea Bisau (Albanian). 2011-01-13. Процитовано 2011-01-13. ↑ Republika e Malavit njohu Kosovën, shtet të pavarur dhe Sovran (Albanian). Ministry of Foreign Affairs of the Republic of Kosovo. 2009-12-16. Процитовано 2009-12-18. ↑ Republika Islamike e Mauritanisë njohu Republikën e Kosovës (Albanian). Ministry of Foreign Affairs of the Republic of Kosovo. 2010-01-13. Процитовано 2010-01-13. ↑ Kosovo passport acceptable for travel to New Zealand. 8 June 2009. Процитовано 2015-09-06. ↑ Official recognition letter by President of Palau (PDF). Ministry of Foreign Affairs of the Republic of Kosovo. Архів оригіналу за March 19, 2009. Процитовано 2009-03-11. ↑ Government has recognised the independence of Kosovo. The Chancellery of the Prime Minister of the Republic of Poland. 2008-02-26. Архів оригіналу за April 21, 2008. Процитовано 2008-03-13. ↑ Comunicado de Imprensa – Kosovo (Portuguese). Ministério dos Negócios Estrangeriros. 2008-10-07. Архів оригіналу за October 21, 2008. Процитовано 2008-10-07. ↑ Kingdom of Saudi Arabia recognizes the Republic of Kosovo. Ministry of Foreign Affairs of the Republic of Kosovo. 2009-04-20. Архів оригіналу за September 17, 2009. Процитовано 2009-04-21. 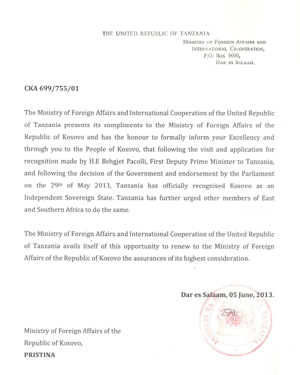 ↑ Sierra Leone Recognized Kosova. Kosova Press. 2008-06-13. Процитовано 2009-03-28. ↑ Solomon Islands recognizes Kosovo as independent state. Solomon Star. 13 August 2014. Процитовано 2014-08-13. ↑ UK to recognise independent Kosovo – PM. United Kingdom Prime Minister's Office. 2008-02-18. Процитовано 2008-05-09. ↑ Entrance Visas in Brazil, Ministry of External Relations of Brazil, August 12, 2015. ↑ Slovak government visa information brochure. mzv.sk. Процитовано 2015-09-06. Цю сторінку востаннє відредаговано о 15:39, 22 серпня 2017.